Coke filmed six such surprise moments for the new spot, by ad agency David—they are "completely unscripted," the brands says, and seem like genuine surprises, though Coke has obviously staged these moments to a degree. They include a surprise announcement, an unexpected homecoming and a meeting between a man and his birth father—emotional stuff, for sure, even if it feels a bit like Coke is somewhat cynically ticking off particular boxes. Personalized bottles play a role in every story, and are innocuous enough. 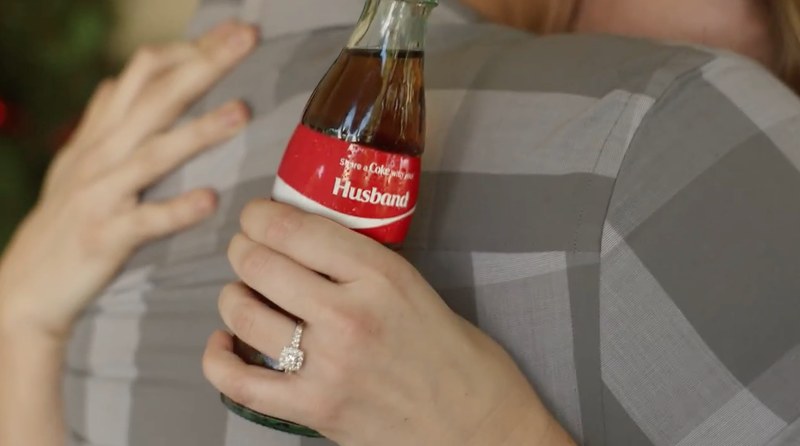 Obviously Coke bottles don't play this kind of role in real life (well, except for pregnancy announcements), but as a way to integrate the product, it's fine. The biggest takeaway is that Coke is going with real moments, instead of something scripted and crafted within an inch of its life—not a new approach for the brand, but one that does resonate at the holidays, when displays of actual heartfelt love are never a bad idea.